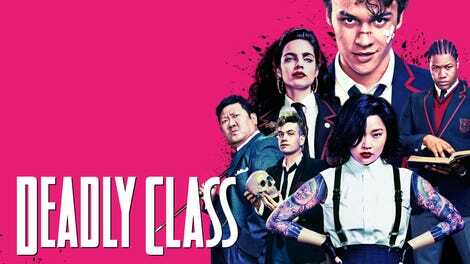 Syfy’s breakneck Deadly Class filters the counterculture aesthetic of Reagan’s America to a generation raised on cinematic tales of vengeance and assassins. Produced by the Russo brothers, it’s very much a story of ‘80s rebellion, complete with John Hughes archetypes, but that tale is one that has been influenced by Park Chan-wook and Quentin Tarantino. Sounds fun, right? And it mostly is. The big question after the premiere isn’t whether or not this show will be dumb fun but if it has learned enough from its cinematic teachers to do something smart? Rick Remender, Wes Craig, and Lee Loughridge’s excellent Image comic book is about finding connection in a group of people trained to sever it in others. The book introduces familiar elements of the teen drama (cliques in the cafeteria, tough teachers, a love triangle) and several of the character archetypes we’d expect from that genre but subverts them. The show, on the other hand, doesn’t have time for that second part. It’s like someone who skimmed the source material telling you what it was about. However, pilots are all about impressing viewers in a crowded landscape—push enough at them and do it with enough energy that they don’t notice the flaws and want to come back next week. On that level, Deadly Class might get a passing grade. The instinct from some writers adapting this source would have been to use the first hour to allow us to get to know Marcus (Benjamin Wadsworth), a homeless, suicidal teen in 1987 San Francisco whose parents were killed in a horrible accident when a mental patient literally fell on them as she committed suicide (an animated flashback that is incorporated into the show almost frame for frame as in the comic book, including the same art). Instead, the writers—Remender & Miles Orion Feldsott—jumble story elements from roughly the first four issues of the Image comic book, remaining very loyal to some while altering others in major ways. The core is the same. A homeless, on-the-run kid named Marcus is recruited to join a school of young assassins, run by the mysterious Master Lin (Benedict Wong). The early, trippy scenes, including an image of Ronald Reagan coming through a TV Ringu-style, are some of the best of the pilot, culminating in a scene in which Marcus is basically kidnapped and taken to Kings Dominion, a school for baby-faced killers, where we meet this show’s version of the Breakfast Club. Like so much teen drama, Deadly Class is about giving voice to the powerless. When you’re a teenager, you have so much to say about your life and the state of the world, but no one wants to listen to it. What if you could make people listen to it? And that rebellious teen aesthetic fits perfectly in the Reagan era, as the chasm between the haves and have-nots grew exponentially. Some of the best beats of the comic have been adapted wholly intact, including the fact that Marcus is interested in the school because he wants to kill the man who ruined his life: Ronald Reagan. The two main narratives of the pilot—Marcus’ assignment to find someone who deserves to be killed & the drama between him and Chico—are both altered versions of similar plotlines in the book and serve as strong ways to define the character as a morally righteous one. He’s only going to kill as a form of Reagan era justice, ending someone who has been murdering the homeless, which no one in power cares to investigate. (This is a twist on Marcus’ first victim’s background that actually works better than the original). As for the Maria/Chico drama, Marcus is a savior, a hero to protect those in need. He’s spurred to action when he sees Maria’s black eye, and it says something about his teen impetuousness that the shiner turns out to be a fake. All of this is narratively interesting enough to get us to the next episode, but the plot moves so fast that the characters aren’t given time to breathe, and so they revert to archetypes. Saya is the Manic Pixie Dream Killer, a pretty girl who can become the hero’s obsession. Maria is someone for the White Knight hero to save. That the supporting characters fit so easily into The Breakfast Club parts isn’t a clever trick as much as evidence of their thinness. Again, it’s just a pilot. There’s reason to believe Deadly Class will slow down and find substance in the style. Otherwise, it’s going to fail with viewers. Props for the wonderfully emo ‘80s music choices this week, including “Behind the Wheel (Remix)“ by Depeche Mode, “The Holy Hour” by The Cure, “The Killing Moon” by Echo and the Bunnymen, “Eighties” by Killing Joke, “Elegia” by New Order, and “Melody Lee” by The Damned. 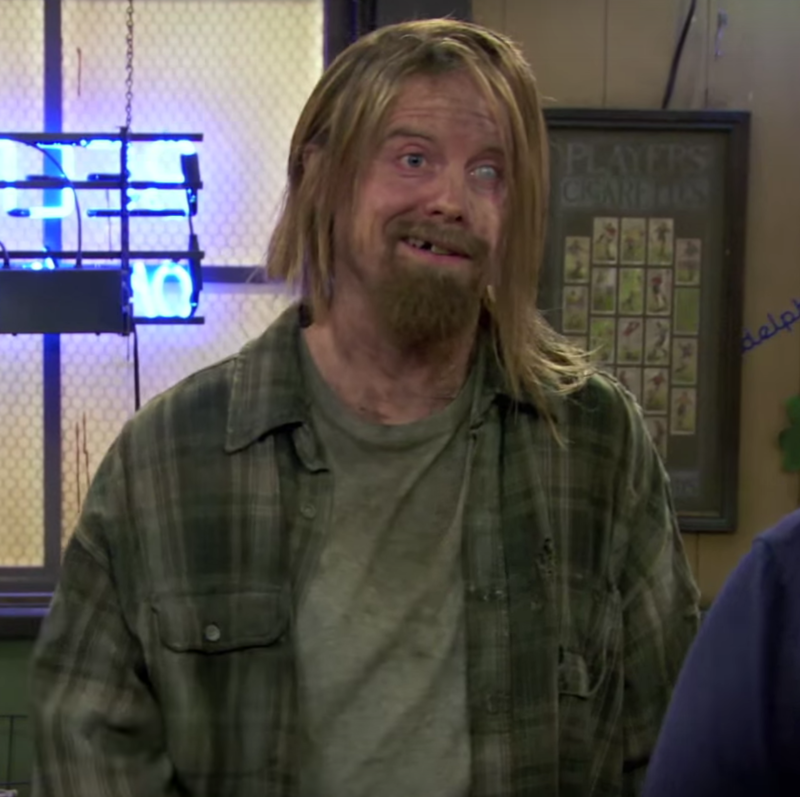 Anyone else have flashbacks to Cricket on It’s Always Sunny in Philadelphia the first time they saw Rory? Crossover!